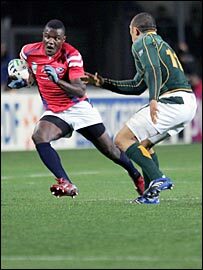 Group A winners South Africa made it four wins out of four as they cruised past the USA in Montpellier. Schalk Burger, Francois Steyn and Bryan Habana crossed for the Boks before Takudzwa Ngwenya scored a brilliant try for the US to make it 24-10. South Africa ran in six more tries after the interval while Chris Wyles crossed for the Eagles. 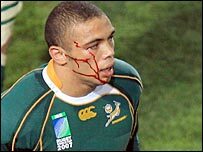 The Boks suffered a major scare when Habana went off with blood pouring from his face after a clash of heads. Coach Jake White is confident the 24-year-old wing will be fit for next weekend's quarter-final against Fiji in Marseilles. But tight-head prop BJ Botha was forced off with a knee problem which looks like keeping him out of the game amd could end his tournament. "Bryan's fine - he's got some stitches in his right cheek," said White. "Botha I think will be ruled out. He's done damage to knee ligaments. "Whether they have to operate or not we'll decide on Monday but I think he's probably out and we'll have to replace him. South Africa, who finished five points clear of England, scored the opening try after nine minutes through Burger, playing out of position at number eight on his return from a two-match ban. Montgomery converted before adding a penalty to put South Africa 10-0 up. The Boks enjoyed territorial dominance as the half wore on but the US defended bravely and even trimmed the gap through a Hercus penalty. Steyn then stepped his way through the Eagles' midfield for the second before Habana sizzled over on the end of an overlap for his 27th try for South Africa. Montgomery converted both to make it 24-3 before the US scored a try of the tournament contender. Todd Clever intercepted five metres from his own line and produced a big hand-off to get rid of Butch James before feeding supporting second row Alec Parker. He found Hercus in support and the fly-half looped out a sumptuous pass to right winger Ngwenya, who had half the length of the pitch to go and Habana to beat. Habana offered him the outside and, after some dancing footwork to get the South African star off balance, Ngwenya took him on before scorching over in the corner and running round under the posts. Hercus converted to make it 24-10 at the break but Habana, who must have spent the interval fuming, raced over for his second try just two minutes after the re-start. Replacement prop CJ van der Linde soon bullocked over, with Montgomery converting, but the Boks then put themselves in deep trouble as they tried to run from their own line. The USA sent the ball left and Wyles crashed over, and it became a bad couple of minutes for South Africa as they lost Habana after he over-enthusiastically chased the restart and clashed heads with Ngwenya. Two more tries, from Fourie du Preez and Jaque Fourie, brought up the half century for the Boks before Fourie grabbed his second try. With six minutes left the USA introduced Thretton Palamo, aged all of 19 years and two days, to become the youngest ever player to feature in the World Cup. He enjoyed one powerful carry, while there was still time left for Springbok flanker Juan Smith to romp over as South Africa and the USA ensured the pool stages at the 2007 World Cup ended in hugely entertaining fashion. South Africa: Montgomery; Ndungane, Fourie, Steyn, Habana; James, Du Preez; Du Randt, Smit (capt), BJ Botha, Van den Berg, Matfield, Van Heerden, Smith, Burger. Replacements: Du Plessis, Van der Linde, Bakkies Botha, Skinstad, Pienaar, Pretorius, Pietersen, Olivier. USA: Wyles; Ngwenya, Eloff, Esikia, Sika; Hercus (capt), Erskine; MacDonald, Lentz, Osentowski, Parker, Mangan, Stanfill, Clever, Payne. Replacements: Burdette, Moeakiola, Aylor, Bloomfield, Petri, Malifa, Palamo.